We welcome you to join us. If you’re interested in paddling with Lōkahi, or in trying outrigger canoe paddling before you make a commitment, come down to the site at any scheduled practice time and talk to a coach. The only pre-requisites are that you can swim or otherwise handle yourself in the ocean, like do a survival float, and that you fill out a current HCRA insurance waiver. Make sure you sign the form. If you are under 18, then you must have a parent or guardian sign the form as well. While there is no upper age limit, you must be at least 9 years old to paddle with us. If you have never paddled outrigger and want to try the sport you can go out with us for a $10 donation per practice session. If you are a member of another HCRA member club, then you will have to transfer to Lōkahi to paddle with us, either competitively or recreationally. If you are a visiting paddler from out of state, you may be able to paddle with us during your visit without joining the club. You can use our contact form to ask this possibility. 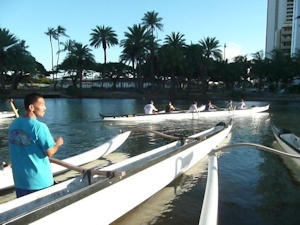 Lōkahi was founded as, and remains committed to being, a competitive canoe racing club. To understand our sport at its deepest levels, and the powerful hold it exerts, you have to experience long distance open ocean racing. If you decide to join Lōkahi as a competitive paddler, you’ll need to complete an application form with “COMPETITIVE” checked and pay the annual dues. You’ll also need to provide proof of ID, such as a copy of your driver’s license or birth certificate, and we’ll take your picture for an HCRA membership card. Turn in the completed app, your dues payment and current HCRA waiver form to the recording secretary or other Lōkahi officer. Current dues for adults, 18 and over, are $170. Paddlers under 18 pay $100. You’ll receive a Lōkahi t-shirt when your dues are paid in full. We encourage you to join with the goal of racing. If you decide you’d rather paddle just for fun and fitness, or if your schedule precludes taking the time required to paddle competitively, then you can join Lōkahi as a recreational paddler. Turn in a completed application with “RECREATIONAL” checked, your dues payment and a current HCRA waiver form. Dues are $80 for 6 months, or $20 per month, from the month in which you join and you’ll be eligible to participate in Lōkahi events short of HCRA-sanctioned competition. You will not be required to participate in club fund raisers, but we welcome your voluntary participation. We’ll provide some coaching and guidance for you as a recreational paddler, and expect you to work hard to learn and improve. When we’re working with competitive crews you may not get the same degree of attention, but we won’t neglect you. You will also be able to keep paddling with us during the off-season from November through February. • Check the current schedules, always subject to change. • To join Lōkahi to race, fill in, print out and sign the Lōkahi application form and check COMPETITIVE. • To join Lōkahi for recreation, fill in, print out and sign the Lōkahi application form and check RECREATIONAL. • Fill out and sign the current HCRA insurance waiver. The competitive season begins in March with the first Hui Wa‘a long distance race. 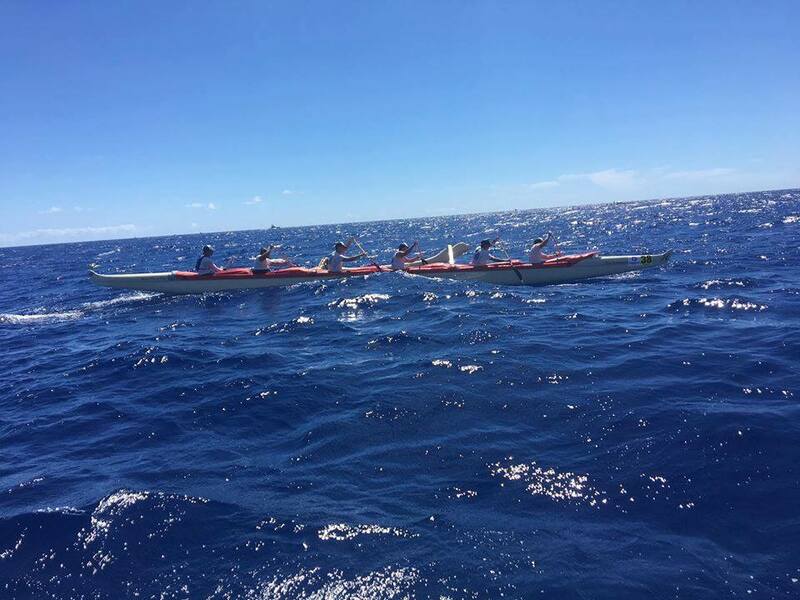 Following the Hui Wa‘a distance and regatta races is HCRA’s long distance season, culminating in the final races of the season, the Ka‘iwi Channel races, Na Wahine O Ke Kai for women and Moloka‘i Hoe for men. Rec paddling practice is held Tuesday and Thursday evenings. We put boats in the water by 5:30pm and should be paddling by 5:45pm. Ask for Lee or Wayne and we’ll get you started. If you’re new to the sport, you don’t have to buy a paddle right away. We have practice paddles you can use. If you decide outrigger paddling is a sport you want to pursue, we’ll give you advice on how to choose a paddle. Wear something you can get wet, such as board or paddling shorts, t-shirt or tank top, and rubber slippers to wear outside the canoe. For daytime practice and preseason distance races you should use sunscreen, and consider wearing a hat and long-sleeved shirt. For all practices we suggest you bring your own water or sports drink. Lōkahi’s site is at the Diamond Head end of the Ala Wai canal, next to the Waikiki Library and adjacent to the Ala Wai Golf Course. The Ala Wai Golf Course Road branches off Kapahulu Avenue. If you are traveling makai on Kapahulu, plan on turning right at the Waikiki Library (across the street from the Chevron station); coming from Waikiki, you’ll make a left turn. Be careful of the fast-moving, heavy traffic on Kapahulu. Some impatient drivers race through the intersection even when the light is red. You should be able to park along the road where our canoes are kept. Please do not park in the Ala Wai Golf Course driving range parking lot and do not use the Library parking areas.